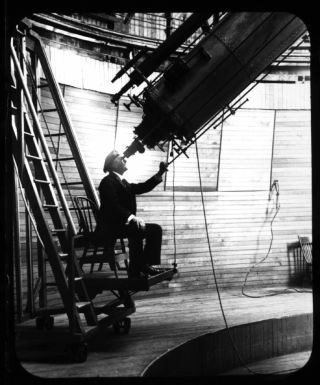 In a historical photo, Percival Lowell looks through the Clark telescope at Lowell Observatory, Flagstaff, Arizona. File photo undated. Lowell Observatory, founded in 1894, is perhaps best known for the discovery of Pluto, but that is not the facility's only contribution to astronomy. Astronomers there have studied Halley's Comet, and the observatory led the discovery in 2007 of an exoplanet. Lowell operates several research telescopes, including the original Clark Telescope, and the observatory recently added an advanced instrument called the Discovery Channel Telescope. The observatory was founded by astronomer Percival Lowell. Lowell picked Flagstaff, Ariz., for his observatory, believing that the high altitude and thin atmosphere would be ideal for observing Mars. Lowell became famous after saying he saw canals on Mars through a telescope. This was later refuted with close-up images of the Red Planet, but Lowell's astronomical legacy persists in the form of the observatory. As it turned out, the observatory became better known not for studying Mars, but for finding Pluto. More than a generation later, Clyde Tombaugh joined the observatory's ongoing search for Planet X. Scientists found discrepancies in Neptune's orbit, and believed a larger planet could still be lurking in the outer solar system. Using photographs taken with a 13-inch telescope (now called the Pluto Discovery Telescope), which was funded by Percival's brother, Abbott Lawrence Lowell, Tombaugh saw movement between different frames on Feb. 18, 1930. It was a tiny world called Pluto. Once considered a planet, Pluto was demoted to dwarf planet status in 2006 after icy worlds of a similar size were found in the outer solar system. Besides planetary studies, the observatory is also known for its work on Halley's Comet. During the comet's last appearance in 1985/86, the observatory led work concerning the comet's production of dust and ice as Halley's got closer to the sun. The observatory's discoveries also include a lot of research on stars. "Former director John Hall and his colleagues, for example, made detailed studies of the energy output of stars, while astronomer Harold Johnson created one of the fundamental calibration scales of stellar temperature in the 1950s," the Lowell Observatory wrote on its website. The Discovery Channel Telescope dome with the Moon overhead. Photo taken April 17, 2012. "The late Henry Giclas, who spent his entire career at Lowell, conducted one of the largest surveys of stellar motions ever done. And, for decades, Wes Lockwood and his colleagues have measured the slowly varying brightnesses of stars like the sun." More recently, Lowell led the 2007 discovery of what was then the largest known exoplanet: TrES-4, a "puffy" world about 1.7 times the size of Jupiter. "Its mean density is only about 0.2 grams per cubic centimeter, or about the density of balsa wood," said study leader Georgi Mandushev of Lowell, speaking at the time of the discovery. "And because of the planet's relatively weak pull on its upper atmosphere, some of the atmosphere probably escapes in a comet-like tail." The observatory today includes three sites in Arizona operating with an annual budget of about $6 million. Lowell is promoted as a good location to do long-term studies of astronomical phenomena that may not be apparent in just a few nights of telescope time. Lowell's advanced age leads to a constant need for upgrades. For one effort – restoring the original 24-inch (0.6 meter) refracting Clark Telescope – officials launched a crowdfunding campaign in March 2013, aiming to raise $256,718 in two months. Lowell's most recent instrument, the privately funded Discovery Channel Telescope, saw first light in 2012. The 14-foot (4.3-meter) telescope takes visible light and spectrographic images at the same time. Some research questions being investigated include how dwarf galaxies came to be, and how the solar system began.